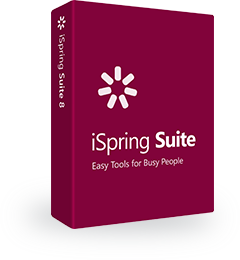 iSpring Cloud is the fastest and easiest way to post all your presentations and iSpring courses online. Here at iSpring Solutions we constantly work to make our service even more useful for you and your readers, so nothing would distract them from focusing on learning. Now we’re happy to present a new iSpring Cloud release with an updated PDF viewer. Now, take a look at the new one. We’ve updated the design and worked hard on usability, and now the application has a new layout and colors. All the tools you need are now easily accessible from the bottom of the screen. You can zoom and view a document in full-screen mode, as well as navigate through pages using arrows. We’ve also added a book mode, so you can read a PDF as if it were a book printed on paper. To switch to book mode, just simply click on the book icon in the bottom right corner of your tools panel. What’s more, the realistic flipping animation makes it look very similar to an actual paper book or magazine. Use the arrows to flip the pages. In the flipping book mode, you can also navigate through pages using thumbnails at the bottom of the screen. To see the thumbnails, click the 4-squares icon to the left of the “Book mode” icon on the tools panel, and you will be able to jump to the page you need in just one click! With these new features, the PDF Viewer in iSpring Cloud will make your readers’ experience even more enjoyable and seamless. We’re not going to stop here, more new features are to come, and we’ll keep you posted. If you still aren’t using iSpring Cloud and have never shared a presentation with it, you can learn more or start a free trial.